Ireland manager Paul Earley pictured with team captain Michael Murphy. Irish International Rules manager Paul Earley has asked the Donegal County Board to postpone its county senior football final so that Ireland team captain Michael Murphy can line out in the first test against Australia on 19 October, less than 24 hours before he’s due to play for his club Glenswilly against Killybegs in the Donegal decider. 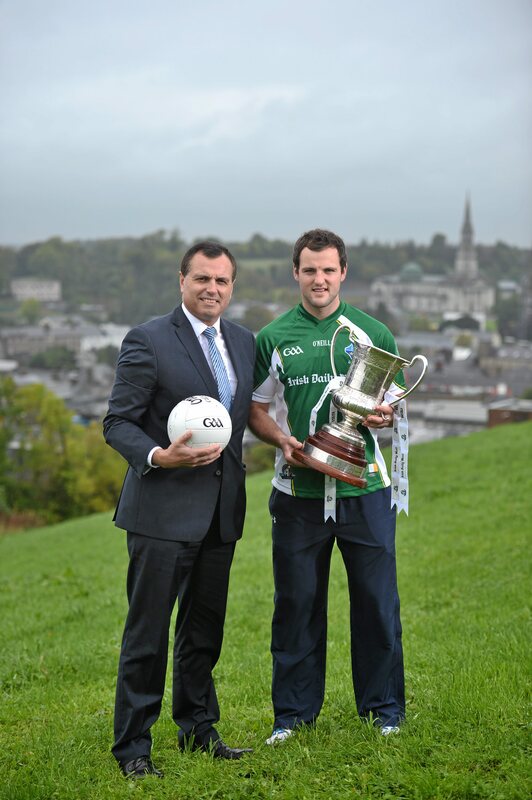 Michael Murphy has indicated that he will forgo the opportunity of leading his country in Breffni Park on Saturday week to concentrate on helping Glenswilly regain the Donegal senior crown that they won for their first and only time in 2011. Glenswilly have not sought a postponement of the county final. Derry legend Tony Scullion, who is a selector on the International Rules team, said he hoped Murphy can be facilitated in some way to play in the forthcoming tests. Officials from Croke Park contacted Donegal officials on Monday seeking the postponement, but the county’s Competitions Controls Committee, which met on Monday night, has rejected the request and remains adamant that the county final will go ahead as scheduled on Sunday 20 October. Donegal’s champions are scheduled to play in the first round of the Ulster Senior Club Championship on Sunday 3 November. With the second International Rules test set for Croke Park on Saturday 26 October, the Donegal fixtures committee has no wriggle room. However, the Ulster Council’s Competitions Controls Committee meets tonight, Tuesday, to discuss forthcoming fixtures and it has the power to postpone the Ulster game. That would, in turn, free Donegal to move its county final to 3 November and avoid a club v country clash for Murphy. Ulster Council has form in this regard: in 2012 it postponed the first round Ulster Club match featuring the Donegal county champions to facilitate the completion of the club championship after the county’s All-Ireland win; and in 2011 it postponed games featuring Michael Murphy’s Glenswilly and Kevin McKernan’s Burren to facilitate both players travelling to play in the International Rules series Down Under.